Now that we know there isn’t going to be a deal we can at least narrow down some of the possibilities of what post-Brexit Britain looks like. In the first year or so we are going to lose a lot of manufacturing. Virtually all JIT export manufacturing will fold inside a year. Initially we will see food prices plummet but this won’t last. Domestic agriculture won’t be able to compete and we’ll see a gradual decline of UK production. UK meats will be premium produce and no longer affordable to most. Once food importers have crushed all UK competition they will gradually raise their prices, simply because they can. Meanwhile wages will stay depressed and because of the collapse of disposable income and availability of staff, we can probably expect the service sector to take a big hit thus eliminating all the jobs that might provide a supplementary income. Across the board we will see prices rising. There will be some serendipitous benefits but nothing that offsets the mass job losses. We will see a lot of foreign investment dry up and banking services will move to the EU. Dublin and Frankfurt. I expect that house prices will start to fall, but that’s not going to do anyone any favours in the short to mid term. Since a lot of freight will no longer be able to go through Calais we can expect a lot more use of the port at Hull so we may see an expansion in distribution centres in the North. All in all we are looking at serious austerity as it will take a few years at least to rebuild our trade relations with third countries. If we go down the path of unilateral trade liberalisation then we will probably find it hard to strike new deals. Meanwhile, since tax receipts will be way down we can expect major cuts to the forces and a number of Army redundancies. I expect to see RAF capability cut by a third. Soon enough it will become apparent that cuts to defence cannot go further so we can expect another round of cuts to council services. They will probably raise council tax to cope with it. After years of the left bleating about austerity they are about to find out what it actually means. Britain is about to become a much more expensive pace to live. It will cause a spike in crime. Interesting though will be how rapidly people adapt to it and habits will change, thus so will the culture. I expect cheap consumables from China will stay at low prices and they manage to circumvent the taxes and import controls anyway. What I do expect to happen is a lot of engineering jobs to be axed since a lot of them are dependent on defence spending. It will kill off a number of parasitic resourcing firms and public sector suppliers. Basically it will wipe out the cosseted lower middle class and remind them that they are just as dispensable as the rest of us. We can the expect to see a major rationalisation of the NHS and what functions it will perform. It will be more of a skeleton service than ever. I expect they will have trouble staffing it. Economic conditions more than any immigration control will bring numbers down to a trickle. In every area of policy a lot of zombie projects will be culled and the things that survive on very slender justifications will fall. We can also expect banks to pull the plug in under-performing businesses. Unemployment will be back to where it was in the 80’s. The London economy will also change. Initially we will see an exodus back to the regions until rental prices normalise to the new conditions. Anyone who considers themselves “Just about managing” right now will look upon this time as carefree prosperity. There are going to be a lot of very pissed off people. This will see a revival of local politics and national politics will become a lot more animated. I expect the Tories will be wiped out and we will have to put up with a Corbyn government for a while, but they will be tasked with making all the major cuts. We’ll soon see how far their “compassion” really goes. Even if Corbs does manage to borrow, it won’t go very far. It won’t plug the hole. Eventually things will settle down and we will get used to the new order of things. My gut instinct tells me that culturally it will be a vast improvement on the status quo. There will be more reasons to cooperate and more need to congregate. I expect to see a cultural revolution where young people actually start doing surprising and reckless things again rather than becoming tedious hipsters drinking energy drinks in pop-up cereal bar book shops or whatever it is they do these days. We’ll be back to the days when students had to be frugal and from their resourcefulness manage to produce interesting things and events. A few years in and we will then have started to rebuild EU relations, probably plugging back into Euratom, Erasmus, and a large part of the single market. It will take some time to plug back into the EU aviation market. The EU will be very cautious about what it lets us back in on. Effectively we are looking at a ten year recession. Nothing ever experienced by those under 50. Admittedly this is not the Brexit I was gunning for. I wanted a negotiated settlement to maintain the single market so that we did not have to be substantially poorer, but, in a lot of ways I actually prefer this to the prospect of maintaining the 2015 status quo with ever degraded politics with increasingly less connection to each other. I’m of the view that in recent years people have become increasingly spoiled and self-indulgent, inventing psychological problems for themselves in the absence of any real challenges or imperatives to grow as people. I have always primarily thought Brexit would be a reboot on British politics and culture. In a lot of ways it will bring back much of what is missing. A little austerity might very well make us less frivolous. What I do know is that the banking crisis of 2008 set in motion a series of events whereby much of the corrective potential of it was dissipated with debt and spending, largely to preserve the political order. The disruptive potential of it was barely felt in the UK. Ever since we have stagnated and though the numbers on screen may tell a story of marginal growth, I just don’t see it reflected in the world around me. I still see the regions dying out and London sucking the life and vitality out of every city, including Bristol. It reminds me that the wealth of a city is its people, not its contribution to GDP. Ahead lies challenging times. It will not be easy. Those who expected things to improve will be disappointed. But then I have a clear conscience in this. I never made any big Brexit promises. I never said there would be sunlit uplands. I did not predict that the government would make this much of a pigs ear of it, or that we would be looking at the WTO option. I expected parliament would step in to prevent that. That it hasn’t tells you a good deal about the state of modern politics. And so with that in mind, as much as I would have had it go a different way, I think, given the opportunity to vote again I would still vote to leave. Eventually it gets to a point where any change will do. I prefer an uncertain future to the certainty I was looking at. “explaining yesterday’s post which seems to have cause something of a stir. The short version is that I do see quite a lot of potential in Brexit to reboot British politics, not least because a trashed economy would finally settle this stagnant politics of ours. It would be the final big push to wean the British off the state. Boris Johnson today sets out a grand vision of Britain’s “glorious” post-Brexit future as a low-tax, low regulation economy paying nothing to the EU for access to the single market. 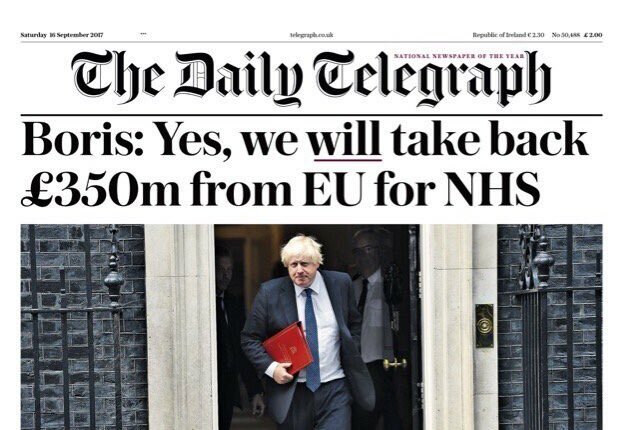 In a 4,000-word article for the Telegraph, the Foreign Secretary restates the key demand of the Leave campaign – that £350m a week currently sent to Brussels should be redirected to fund the NHS. He says that Britain should not continue to make payments to the EU after Brexit and that ongoing membership of the European single market and customs union would make a “complete mockery” of the referendum. The crown jewel of Johnson’s fantasies is the lie that we will take back £350 million a week from the EU, a lot of which can be spent on the NHS. This is untrue not just because we never send the EU so much money, although this is what makes the statement a bare-faced lie. It’s not even because around half of what we actually send to the EU comes back to be spent in Britain or is counted towards our international aid target. It’s such a big lie because Brexit will knock the economy so badly that we’ll have less money to spend on our priorities not more. What about the rest of Johnson’s vision? He wants to tackle the housing crisis, improve our infrastructure, fix our schools, become a tech powerhouse, boost scientific research and build on the strength of our universities. Some of these ambitions, such as paying for homes, schools, infrastructure and research, will cost money, which we’ll have less of if we quit the EU. Others will be directly undermined by Brexit. Our universities are already suffering a brain drain as EU citizens no longer feel welcome. And does the foreign secretary seriously think that cutting ourselves off from the EU’s digital single market is the way to spawn tech giants? What’s more, to pretend that EU membership prevents us from investing in homes, schools or infrastructure is outrageous scapegoating. The blame belongs with successive British governments, especially Johnson’s Conservatives. The foreign secretary tells us airily that there are “obvious ways” in which Brexit will help tackle the housing crisis. It’s a shame that none made its way into his article. He merely notes that “there may be” ways to simplify planning and floats the idea of taxing foreign buyers before dismissing it as a bad policy. Is this really all he’s got? Johnson says leaving the EU will mean we won’t be able to pin the blame for our own failings on Brussels. But this is not an argument for Brexit. It’s an argument to stop scapegoating the EU, a practice on which the foreign secretary has built his career. Johnson has also identified a new scapegoat: “Young people with the 12 stars lipsticked on their faces”, who are “beginning to have genuinely split allegiances”. This phrase has a nasty history. The slur that Catholics’ true allegiance lay with Rome was used to exclude them from British politics. The foreign secretary knows perfectly well that a person can have more than one allegiance without being any the less patriotic. He himself did not give up his American passport until 2016. The young people marching against Brexit are doing so because they do not want to see Britain weakened by this disastrous mistake. This is the most patriotic motive of all. Yesterday, the foreign secretary, Boris Johnson, published an extraordinary 4,000-word article setting out his vision of a glorious British future outside the “trusses” and regulations of Brussels. It was wrong on every count, yet was a fascinating window into the contemporary conservative mind living in a parallel universe only fleetingly in touch with reality, but which is leading the country to perdition and division. It cannot be allowed to pass uncontested and unchallenged. Mr Johnson succeeds in blaming almost every British ill – from uninspiring training to our dilapidated infrastructure – all or in part on the failing efforts of a Brussels elite to create a federal superstate. Incredibly, he writes that once free of the EU, Britain will be able to organise, plan, build the homes and infrastructure we need, give our children skills and – bingo! – we will become glorious and rich. None of this is allegedly possible as an EU member. The new alchemy will be simplifying regulations and cutting taxes, doing trade deals as “Global Britain”, alongside boosting wages and productivity. This, in the language of those gilded Etonians Johnson and Jacob Rees-Mogg, is bilge and balderdash. It is true, as Johnson observes, that Britain is failing on many fronts, but to lay the blame, extending even to low wages, on unnamed EU regulations is fantastical. The blame needs to be firmly pinned on the policy framework – weak regulation, low taxation, minimal public intervention and unwillingness to invest in public infrastructure and services – which he champions. The EU, with its readiness to offer protections for temporary workers and parents, insistence on high-quality environmental legislation, its ambitious cross-country research and development programmes and expenditure on regional development, has instead partially alleviated the great British disaster that Johnson and his Thatcherite cabal have provoked. The EU is a far more reliable deliverer of the aims to which Johnson now lays claim, but which his policy framework and philosophy cannot produce. Thus, it is not Brussels regulations that have caused low wages, the growth of insecure freelance and gig work and the accompanying plunge in productivity growth. British labour law was enacted in Britain by politicians Johnson lionises and seeks to emulate. The increase in desperate poverty, with widespread growth of food banks, is because Conservative politicians, with Johnson as cheerleader-in-chief, have so attacked Britain’s social contract that it is mean and full of gaps. It is not Brussels regulations that have caused England to have eight of the 10 poorest regions in northern Europe. Britain’s incapacity to develop policies that spread income, work and opportunity around the country is once again minted at home. The thought processes that lead Johnson and his ilk to blame Britain’s house-building record, dismal track record on skills and low expenditure on science on Brussels can only be wondered at. Equally, the notion that Britain is going to embrace free trade by leaving the single largest free trading bloc in the world is bewildering. There are no easy free trade deals to be done with the US, China and India that can compensate for what will be lost with Europe, which is, in any case, looking to protect its interests and salivating at the prospect of negotiating with Brexiters who have as little grasp of economic reality as Johnson. Nor is the Commonwealth going to be a soft touch. All hope to scalp a country that has chosen to isolate itself from its neighbours and friends. In one respect, Johnson has done the country a service by his effusions, timed as much to put a marker down on his leadership ambitions while undermining his lame duck leader as making a contribution to public debate. He has at least recognised the scale of the economic and social reconstruction that has to be done, while simultaneously demonstrating that the philosophy, policy framework and upside-down vision of the “global Britain” he champions is the wrong means of achieving it. Britain does need a wholesale refashioning of its economic and social model. Our capitalism needs to be repurposed. Rather than the shibboleth of ever lower taxation, we must think in terms of what skills, infrastructure and public services we need and then levy the taxes required. We have to declare firmly that the country is open and internationalist by remaining a member of the largest free trade area in the world. Above all, we need to restate our values. Britain is a tolerant, rule-of-law society that vigilantly ensures its economy and social structures work for all. Those are the values of the European Union, with whom we should be making common cause, not heading off for an imagined Thatcherite utopia, the cause of so much of what has gone wrong in contemporary Britain. British Thatcherites, not the EU, are the cause of our current ills. In yet another blow to UKIP leader Paul Nuttall’s chances in the Stoke Central by-election later this week, the Chairs of UKIP Liverpool and Merseyside have both resigned. It’s extremely rare for this writer to be able to say ‘well done’ to anyone from UKIP, but both gentlemen have taken a stand on principle and that’s laudable. Although the timing of our resignations is unfortunate in light of upcoming elections, both Adam and I wish to make it clear, where the painful subject of Hillsborough is concerned, with closure not yet in sight, this unprofessional approach and crass insensitivity from high profile people closely within and without Ukip is upsetting and intolerable. We identify most strongly with all the good people of Liverpool and most importantly the families of the Hillsborough victims who have fought so hard and long for justice, in their condemnation of the way Ukip has handled these issues. I felt supporting a libertarian party was the right thing to do in order to affect change in the political system in this country. Unfortunately that dream has been shattered and the potential of Ukip has been squandered by people who have demonstrated they are not fit to lead. Nuttall’s campaign – and even his party – appear to have come apart at the seams. The SKWAWKBOX, which initiated this chain of events and added various links to it – especially the revelation that Nuttall and Nigel Farage had smeared the Hillsborough families in an attempt to get off the hook (a fact that is unlikely to be unconnected to today’s resignations, given the wording of the statement), is proud to have played its part in what should be a ‘dustbin of history’ moment for UKIP’s leader and hopefully even his party. Nuttall and Hillsborough: liar, fantasist … or just unwilling to support the campaign? Last month, the SKWAWKBOX raised questions about UKIP leader Paul Nuttall’s claim, on a regional BBC politics programme, to have been present at the Hillsborough disaster that claimed 96 Liverpool lives and highlighted the serious apparent inconsistencies in his claim – within the space of a minute – to have been inside the ground observing, inside the ground in the crush and outside the ground in the crush. As with the exclusive on the European investigation into huge fraud allegations, the Hillsborough article led to some claiming that the SKWAWKBOX was propagating ‘fake news’. And, as with the fraud investigation article, after a month or so the mainstream media ‘broke’ what this blog had aired first. And Nuttall himself seems to have led to it. As the Guardian states, the above points do not constitute definitive proof that Nuttall was not present at Hillsborough, but they do underline the serious questions about his claims in black ink – and his responses may suggest a man in a hole and still digging. If he is found to have lied about it, it would surely end his political career. It will now be interesting to find out whether he has ever come forward to make a witness statement to the police, as making a false statement would be a punishable criminal offence and therefore something to avoid if he wasn’t really there. FOI request to the IPCC, then. Denial is a dramatisation of the libel case brought by Holocaust denier and Hitler apologist David Irving against the American academic Deborah Lipstadt (author of Denying the Holocaust, in which Irving featured prominently) and Penguin Books (which published her book). The film has received mixed reviews. Some critics have described it as “hammy”, “stuffy and repetitive”, and “a standard issue legal drama”. The character of Lipstadt has also been criticised as “so predictable” and “an impassioned mouthpiece with no internal life.” And given the well-known result of the real-life trial — in 2000 a High Court judge found that Irving had knowingly distorted history and ruled in favour of Lipstadt and Penguin Books — the eventual outcome of the trial is not a source of tension in the film. But the film is well worth seeing. Irving is such a truly repulsive character, and the contrast between him and Lipstadt so absolute, that the audience can only enjoy the wait for Irving’s eventual defeat in court, and then relish the moment of his demise Irving does not look at people. He leers and scowls at them. When he speaks, his face twists into a grimace. He is full of his own bloated self-importance, but fawning and sycophantic towards the judge in court. During the film Lipstadt and her legal team watch clips of Irving addressing neo-Nazi rallies, making racist “jokes”, and denying the genocide of the Holocaust. The cheap and grainy quality of the clips helps emphasise the tawdry and seedy nature of the character they show. Irving also excels in a poisonous anti-semitism-by-innuendo. “Who pays you to write your books?” asks Irvine when he “ambushes” Lipstadt in a lecture at the start of the film. According to his libel claim, Lipstadt is “part of a world conspiracy to destroy his reputation.” And in one of the court scenes he refers to “those who funded her (Lipstadt) and guided her hand.” But, for all his bravado, Irving is also a pathetic figure. As Lipstadt’s barrister points out, Irving wants to be seen as a great writer and historian and hankers after respect — “England is a club and he wants to be a member of it.” That makes Irving’s defeat all the more complete and all the more enjoyable when it arrives. He loses the trial, he is exposed as a charlatan rather than a historian, and when he tries to shake the hand of Lipstadt’s barrister — as if the trial had been a public school sixth form debate — the latter abruptly turns his back on him. Lipstadt, on the other hand, is built up into a champion of the oppressed. Her name, Deborah, she explains, means leader and defender of her people. She is a woman and a Jew, which is one reason why Irving is so intent on pursuing her. And she has no interest in negotiating, compromising or reaching an out-of-court settlement with Irving. She also spells out the importance of the case in which she is the central figure: if Irving wins, then Holocaust denial receives a judicial stamp of approval as a legitimate opinion. There is no face-to-face confrontation between Lipstadt and Irving in the film. But there is a succession of dramatic confrontations between Lipstadt and her legal team. Lipstadt wants to give evidence at the trial. Lipstadt wants Holocaust survivors to give evidence at the trial. Lipstadt promises a Holocaust survivor that the voices of those who did not survive will be heard at the trial. But her legal team will have none of this. Not that her barrister is portrayed unsympathetically: he seems to live off red wine (preferably drunk out of a plastic beaker rather than a glass), sandwiches and cigarettes. There is the same element of caricature about the High Court judge: apparently unaware of the invention of the computer, he writes his judgements with a fountain pen while drinking freshly made tea. And, without the assistance of a butler, he would surely never manage to put his wig on straight. Cinema-goers whose idea of a good film is a five-hour-long adaptation of a novel by Proust, directed by Wim Wenders, and full of lengthy shots of dreary Swedish coastlines punctuated by endless internal monologues should steer well clear of Denial. But for those who like a film where the good guys win and the bad guys lose, Denial is a must-see. Many of us were genuinely shocked by the failure of supposedly serious BBC journalists to challenge the lies of the Brexit leaders during the referendum campaign, and the willingness of the BBC news to treat those lies as though they were serious, legitimate political arguments.. The BBC’s craven capitulation to the Brexiteers continues apace. I awoke this morning to Radio 4’s Today programme, compiled by ‘guest editor’ Helena Morrisey, billed in the Guardian thus: “Morrissey, who spent 15 years as chief executive of Newton Investment Management and also spoke out in favour of Brexit, said she would be “exploring the theme of ‘power to the people’ in a year when democracy reasserted itself and disruptive forces were unleashed, leaving many of us scrambling to work out what happens next”. This ultra-wealthy member of the ruling class and representative of finance capitalism, was allowed to present herself as some sort of persecuted representative of ‘the people. The entire programme was a plug for Brexit, with virtually no balancing opinion. Michael Gove was allowed to lie (again) about what he said about “experts” (he now claims he only meant economists) and the usually excellent Stephanie Flanders scarcely challenged him, allowing him to semi-defend the “£350 million per week for the NHS” lie. The BBC’s craven capitulation to the lies of the Brexiteers is all the more worrying in the light of the government’s ‘power grab’ whereby ministers will have increased powers to pick political allies for senior jobs at public bodies like the BBC. Post-referendum (and the election of Trump), we live in an age of shameless cronyism, patronage, fear and ‘post truth’ – or to give ‘post truth’ its simple, correct name: lies. Of course, some on the idiot-left continue in their state of denial. Chris Gould asks (M Star October 11) for an analysis of the 1956 Hungarian uprising and its effects. I was working in Budapest before, during and after the fighting and met Matyas Rakoski, the general secretary of the Hungarian Working People’s Party and the man largely responsible for the crimes and policy mistakes that led to the uprising in October 1956. It started with a student demonstration at the Petofi memorial, demanding to be allowed to travel to Western countries. It had been banned, then the ban was lifted and I went to look. He said that the policies of the party and the government were correct and would not be changed. I was in Parliament Square listening to the broadcast, and the good humour of the crowd visibly turned to anger. A fortnight later I found myself trying to bandage Soviet soldiers. It covered our views on party democracy in Hungary, Hungarian and Soviet party relations, democracy and corruption. Gollan passed it on to the Soviet ambassador in London and he sent it on to the central committee of the Communist Party of the Soviet Union and to the Soviet foreign office in Moscow. It was eventually published in a Soviet journal. John Callaghan in his “Cold War, Crisis and Conflict: The CPGB 1951-68” gives a brief account of what was happening in Hungary in 1956 and a fuller account of their effects on the British party. I hope the above may help Mr Gould. 1956: the Hungarian revolution – A short and clearly written history of the Hungarian workers’ revolution against the Communist dictatorship. Hungary ’56 – Andy Anderson – Excellent pamphlet, published by Solidarity. An invaluable guide to the events of the Hungarian uprising of 1956. 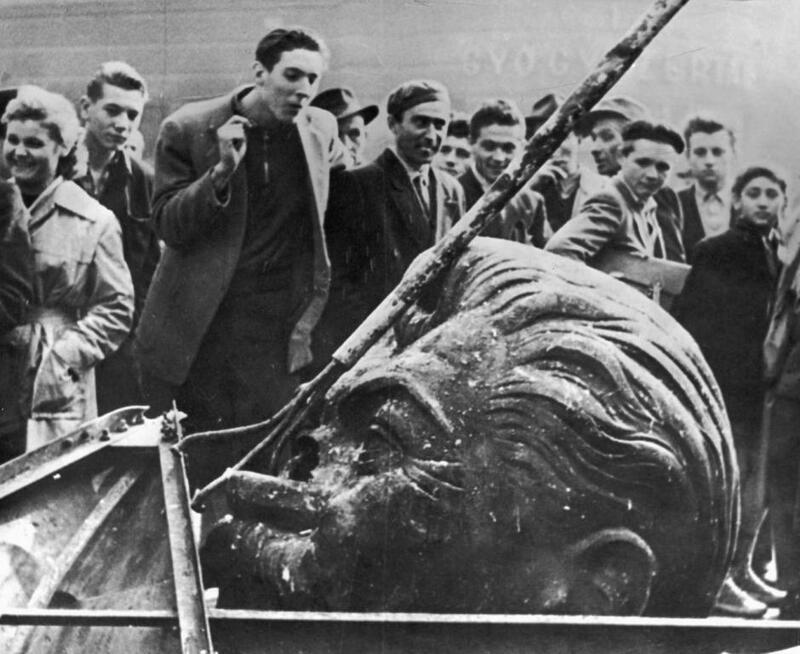 Hungary ’56: “the proletariat storming heaven” – Mouvement Communiste – Analysis of the Hungarian workers’ uprising, stressing the importance of the collective action taken by workers and critically examining the demands and programmes they put forward. Hungarian Tragedy – Peter Fryer An account of events in Hungary 1956 by Peter Fryer, then a columnist for the Daily Worker, the official paper of the Communist Party of Great Britain. The Hungarian revolution: 1956 – Anonymous account of the events of the near revolution of 1956, containing interesting information from interviews with participants. United Nations report on the Hungarian uprising 1956 – UN special committee report on the 1956 Hungarian uprising. Examines the revolutionary workers councils established by Hungarian workers, and analyses the dangers they posed to both the Soviet bureaucracy and capitalism. Hungary ’56 – Nick Heath – History of the Hungarian uprising of 1956, published as a special supplement of Anarchist Worker on the 20th anniversary in 1976. The Hungarian workers’ revolution – Syndicalist Workers’ Federation – Revised second edition of a pamphlet written by British syndicalists in 1957. Hapless challenger for Labour leadership, Owen Smith, in the course of the BBC Question Time debate last week, mentioned the Alliance for Workers Liberty in the context of “anti-semitic attitudes” within the Labour Party. Anyone with even the most cursory knowledge of the AWL will know that it is the one group on the left with a consistent record of opposing all forms of anti-semitism, including “left” anti-semitism and “absolute” anti-Zionism. “There are people on the far left of the Labour party who are flooding in to our party and that’s their word, not mine.The Alliance of Workers Liberty only a couple of weeks ago said ‘let’s flood into the Labour party’. On BBC Question Time (Labour leadership debate, 8 September) Owen Smith, in the stream-of-consciousness style that has come to typify Smith’s approach to political debate, links the Alliance for Workers’ Liberty (as part of the “hard left in our Party” “flooding into the Party”) to those on the left who “associate anti-Zionism, anti-imperialism”, “anti-Israel” perspectives (sic). That is, he implicitly called us anti-semitic. This incoherent tirade against the “hard left” was a disgraceful intervention into an important issue that deserves serious, well-informed debate. Smith’s comments referred back to an earlier exchange with Jeremy Corbyn in the programme in which he accused Corbyn of not doing enough to make the Party a safe place for Jewish members; and the hard left (which would, he implied include the AWL, were causing this problem). There were other accusations streamed into Smith’s tirade, but let’s focus on the accusation of anti-semitism. You don’t have to know very much about what the AWL stands for, agree with the AWL’s two-state position on Israel-Palestine, or even be very left-wing to be aware that any accusation of “left anti-semitism” against us, however half-stated, is ludicrous. We have spent many years exposing, analysing and fighting this phenomena and it has not won us many friends on the organised hard left! Whatever happened to that “£350m-a-week for the NHS” promise? The Brexit liars must never be allowed to forget this. Above: Johnson and Stewart, a pair of shameless liars. The result of the EU referendum stands, so the focus is now on how to get the best deal for the UK. Those who voted leave, many of whom are in our constituencies, did so for a number of reasons. One was the promise that EU membership cost £350m a week and that this money should go to the NHS. This was the most prominent spending pledge of the leave campaign – spelled out on their campaign bus so no one should be in any doubt – and constantly repeated. The prime minister has said Brexit means Brexit but doesn’t know what it means. All we know is that the government has said this money isn’t coming. We warned this was a lie – and so it turns out to be. But there should be no escaping this pledge for the leave campaign – they cannot walk away from it now, disown it or pretend it never happened. They must either admit it was a lie and apologise to their voters, or justify it and explain when it is coming.On behalf of the communities we represent, we will keep asking, where is the £350m for the NHS that was promised by the leave campaign? Many will have voted to leave based on this pledge. Those who made the pledge must now be held to account for the promise they made.